If you want to look stylish and elegant when traveling, then you have out a garment bag. 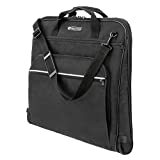 Garment bags are ideal for short trips where you need a few clothes and personal items. These bags are a perfect fit for carrying suits without causing any wrinkles. You don’t have to alight and start looking for an iron board. In this post, we’ve selected for you the ten best garment bags to keep your clothes wrinkle-free, safe and secure. Go through our list and make sure you get yourself a bag that best suits your needs. Zegur bag is a quality garment bag with superior and multiple interior pockets for maximum storage capacity. It offers hassle-free packing, and one can easily store shoes, suits, dresses, and ties. There is a further exterior pocket for personal gadgets. The unique design of this bag keeps items wrinkle-free ensuring you have an easy time getting ready on arrival. It is a sleek and elegant design that will make you look fashionable. It is easy to carry and features a detachable shoulder strap, waterproof exterior, and high-quality zippers. This is another leading brand in the industry with good reviews online. The bag can hold up to three dresses/suits and still leave enough room for shoes, ties, and belts. It features small interior pockets with zips for added storage. There is a further deluxe organizer pocket on the front of the bag to store personal items like ear pads, notepads, and pens. It is a highly portable bag with a detachable and adjustable shoulder strap for easy carrying. The TruMod is a home garment bag that helps you organize your suits, dresses, linens and heavy coats. You can use it to keep clothes organized in color and tidy. The construction of the bag is a quality non-woven and breathable fabric. It appears like linens and feels comfortable with great cushioning. The bag is portable and ideal for home storage or when traveling. It features stress-free deluxe zippers that open and close with ease. This is another large polyester garment bag with a large main compartment for storing suits and dresses. There are two further zippered pockets to help you store small garments and personal items. Both compartments are zippered and will secure your items. The construction of the bag is the durable 600D polyester with a further PVC lining to make it waterproof. It is a highly portable bag measuring 24inches wide by 39 inches long and a depth of 4-1/4 inches. 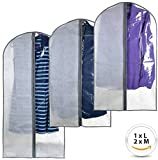 This is a hanging garment bag measuring 40 by 24 inches with a breathable garment construction for safe storage of your clothes. The bag features a transparent window for easy viewing of the contents inside. The non-woven materials allow for easy folding and stacking when storing. It is a pretty versatile bag with a front zipper for easy access to the clothes. This further prevents the clothes from wrinkling. 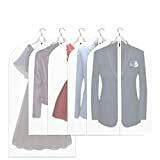 Overall, this is an excellent garment bag for a wide range of garments like suits, dresses, coats, tuxedos, blouses, uniforms and much more. It covers garments fully making it ideal for travel. This is a lightweight and dust-proof garment bag made of strong polyester fabric to serve you for long. 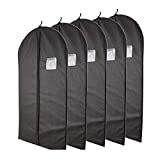 It is a value pack of five garment bags that are resistant to mildew and water. The bag is an ideal size for suits, tops, trousers, shirts and sports coats. It is an ideal choice for your travel and storage needs. There is a translucent window for easy identification of the items inside the bag without opening the zip. Overall, it is an easy to arrange garment bag and one that can easily be washed and reused. 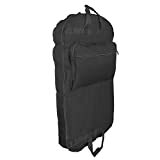 This is a durable garment bag made of the rugged ripstop nylon for long-lasting use. It is a versatile choice with a top hanger that allows for faster access to the clothes inside. It also features a magnetic snap for easy opening and closing. It is a highly portable bag that can easily be folded. There is a sturdy and full-length zipper at the center for easy access. A further clear PVC window allows for easy identification of the clothes inside. Overall, this is an excellent travel bag capable of carrying 1-2 suits. 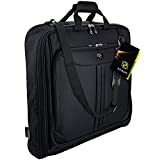 This is a Poland made garment bag with large interior space to fit three suits and shirts while keeping everything organized. It is a versatile bag with zippered pockets on the interior side which further increase the storage space for personal items. The bag keeps the suit in good shape so that you can get ready right away. Interior straps further help minimize any movements. The design of PROTTONI Bag is unique and highly portable for easy carrying on planes. It also features an interior PVC lining to make it waterproof. 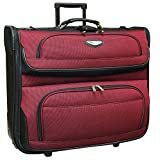 This is another lovely garment bag with caster wheels for easy movements when traveling. It is a high-quality bag with a durable 1200d polyester construction. The bag features a front panel EVA reinforcement and two-tone appearance. The shoulder straps of the bag are adjustable and detachable. They also feature a non-slip pad to feel comfortable on the shoulders. Overall, this is excellent with a large main compartment and zippered mesh pockets. This is a largely expandable garment bag ideal for storing a wide range of items. The expandable cover side is ideal for storing larger items like suits, dress, and coats. The bag measures 22 by 40 inches but can be expanded to measure 22 by 40 inches. It also features several organizational pockets for easy storage of small garments like underwears and personal items. The shoulder strap is adjustable and unique featuring a leather pad for added comfort. Overall, this is a durable waterproof garment bag with a metal hanger that can easily be pulled from the side. When traveling, you need to have your suits, dress, coats, and shirts in the best condition. This ensures you get ready for appointments without looking for ironing boards in hotels. This is only made possible when you have the best garment bags. Make sure you choose one from our reviews below to make your travels easier.